Made some sample blocks. These are now on their way to Etobicoke in anticipation of the Elephant Parade workshop I will be providing for the Etobicoke Quilters' Guild on April 2nd. 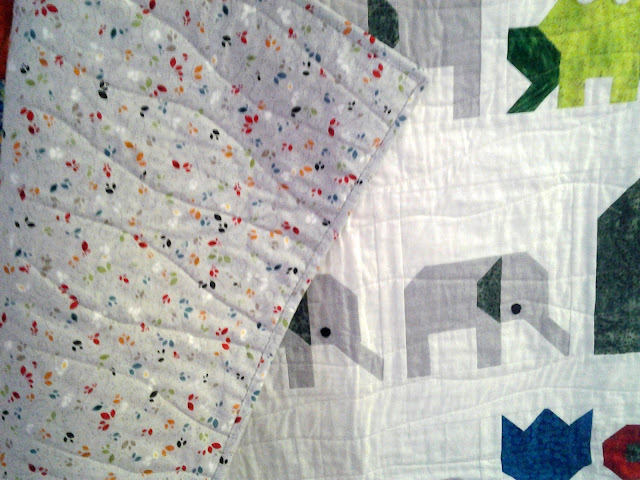 I have already made the Elephant Parade quilt twice myself. But after seeing all the wonderful works of those who quilted along, it was fun to choose some prints to use instead of my regular solid choices. 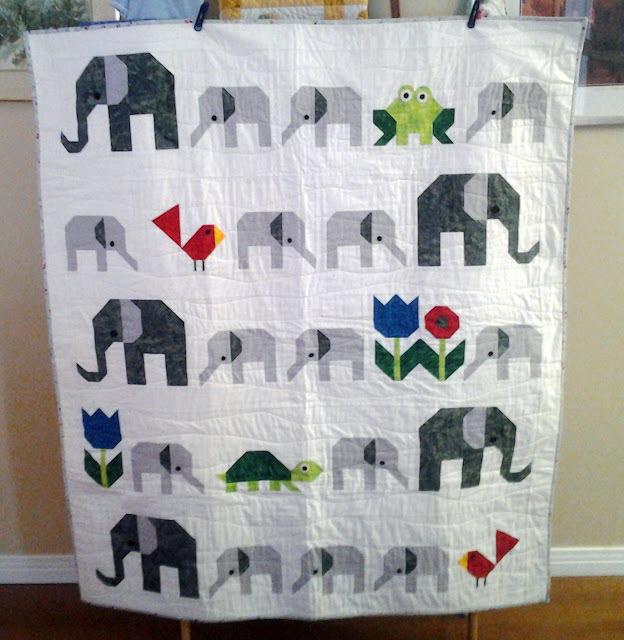 This is offered as a free quilt along from last year and there is a never ending linky party where you can see all those who shared their own rendition of the Elephant Parade here. This week I also have a few quilts to show off. Each made by readers who submitted their photos to me by email. First up.... It's an Elephant Parade! "Finally finished and really happy with the look . Enjoying snow days lots of sewing time.i have also enclosed photos of elephant parade finished as well. Looking forward to making more of your quilts. Congratulations on being published in the Quiltmaker magazine. Dianne Knight"
I met Dianne while I was teaching the Fox & Friends workshop up in Kincardine back in November. Dianne showed me her completed Elephant Parade quilt top at that time. She had hand appliqued the sweetest little eyes on all of her parade participants. I am loving that soft grey backing fabric with those colourful specks of the colours used in the front! And the organic wavy line quilting? You know how I feel about that! Beautiful! 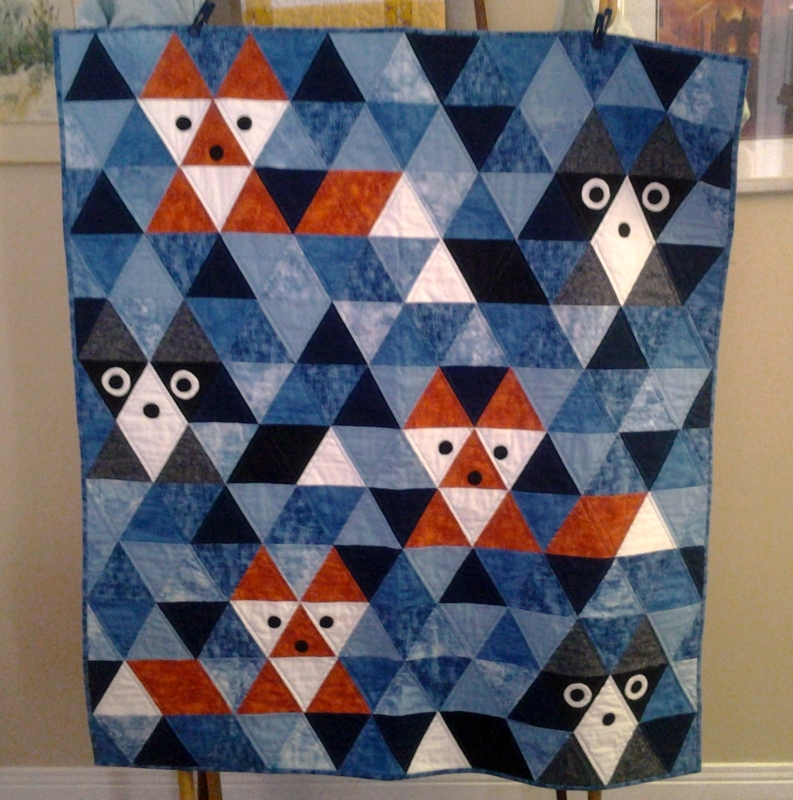 Here we have Dianne's completed Fox & Friends quilt. You can read more about that workshop here. That wee owl print and luscious orange stripe make the perfect backing for this quilt. Dianne chose to quilt along the seam lines on the diagonals. What a sweet finish! 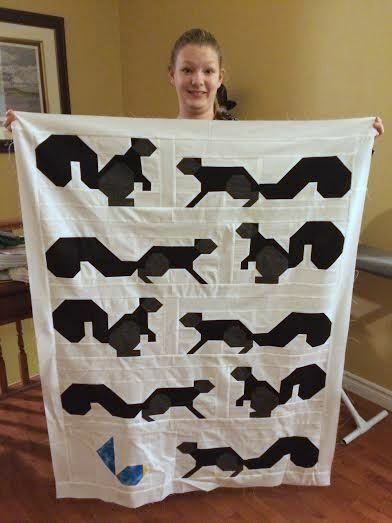 Jennifer Schumm also sent me a photo of this cute Squirrels in the Park quilt top. Jennifer has a longarm business and fabric shop in New Hamburg, Ontario. You can visit her at her website Quilting by Design. And one more thing to share with you. 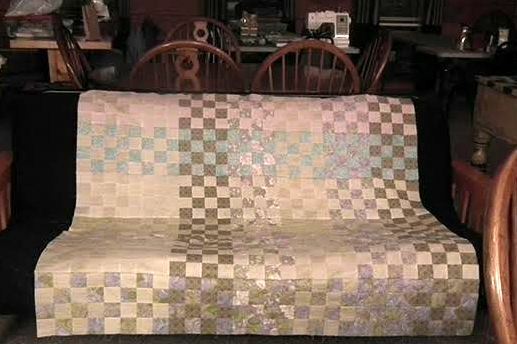 A Pretty In Plaid quilt top, made by Joanne Maner. I wanted to thank you for this wonderful pattern. When I saw it I fell in love with it and knew I just had to make it. Just wanted to share a picture of mine with you. I made it while at a retreat in 2015. I ordered a FQ bundle from Craftsy and thought it might work for it. Mine is a much more pastel rendition but the plaid shows up and I am very pleased with it. The fabric I used was RJR Showers of Flowers by Susie Johnson. I pulled the fq's that I thought might work and then crossed my fingers. I was having so much fun seeing it come together that I stayed up the whole night so I could get it finished. At 5am I sewed the last seam and pressed it for its picture. Glad you enjoyed seeing it in a different color way. Joanne"
The Ugly Christmas Sweaters QAL has begun. Check out the quilt along page for details! 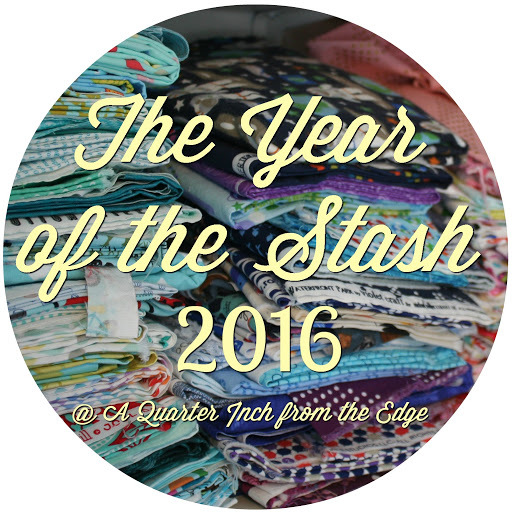 This is it... 2016 is the Year of the Stash! Do you have stash issues? Is your stash out of control? Do you even know what all's in your stash? Jenn of A Quarter Inch from the Edge is hosting a series you may be interested in. Jenn has written a Manifesto, stating her intentions to get her stash under control and prevent the storage space from becoming any further overrun. And she is providing some great tips and lots of encouragement for those of us who are having stash issues. I was hanging back at first. Stash issues? Nope. Not me. Denial? Maybe. But realistically I knew that my stash needed some TLC. Some sorting. Some organizing. And perhaps some kind of inventory system. And definitely some labels. Back in September I moved out of the "quilting hallway" and shared a post showing what things looked like into my new sewing room. I did go through some of my "stuff" during that move. But my stash still really needed a good clean up. Now, as all of you know, going through your stash with the intentions of cleaning up and clearing out???? Well, that just gives you a bit of a panic attack! As quilters, it is only natural to have a little anxiety when sorting through your fabric and trying to decide what to KEEP and what to GIVE AWAY. Repeating the phrase, "I am not a hoarder. I am not a hoarder." helped a little. And I did my very best to fight the urge to KEEP. I love these long totes for storing yardage. Especially for backing. Less wrinkles! The above photos show how things were looking after gathering up ONE bag of fabric for my mom. Knowing all of my GIVE AWAY items would be going to a good home, made it so much easier. The fabric I removed from my stash will all be going to my mom. She is out of pillowcases! My mom has some experience quilting, but mostly she is a sewist. She made clothes for us when we were kids. And now she sews for other kids. 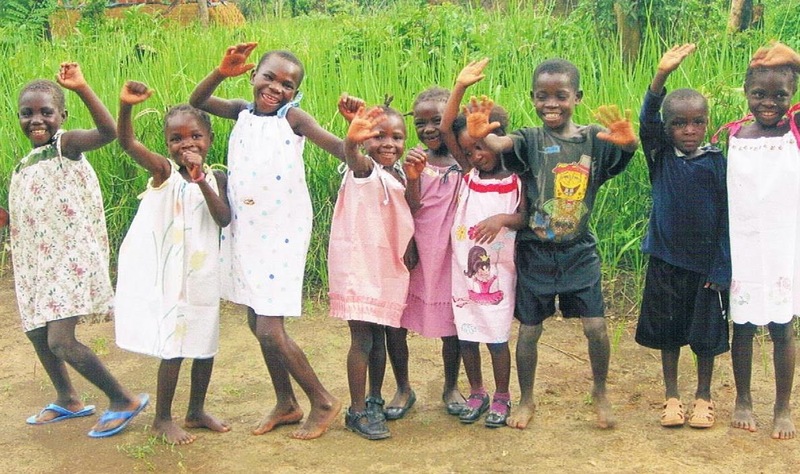 A few years ago, my mom began sewing dresses for children through Little Dresses for Africa. During that time, she has made over 900 pillowcase dresses. And she has also scoured the sales racks for specials on shorts and t-shirts for little boys. Her contributions have been shipped overseas. And her hard work has paid off in the rewards of happy smiling faces! This photo was given to her by the mission worker who delivered a shipment of clothing which my mom had contributed back in 2014. These girls are wearing some of the dresses that my mom made and the boys have on the shorts and shirts she found. 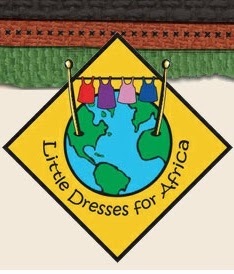 Little Dresses for Africa is a non-profit 501c3, Christian organization, which provides relief to the children of Africa. Simple dresses are made out of pillow cases, and distributed through the orphanages, churches and schools in Africa to plant in the hearts of little girls that they are worthy! Now of course I did not give away ALL of my stash. There is still plenty left to play with. And while I was sorting, I took the time to gather up some pieces to do this remake of the Rural Squirrel quilt in neutrals. The Northcott Rural Squirrel version has been completed and I will be sharing about it in a post very soon! And I sorted some aside for future use in another Dog Gone Cute. But I still have intentions to do more sorting, organizing, labeling and creating an inventory. Join me over at Jenn's A Quarter Inch from the Edge! I am so excited to have completed both the Maxi and Super Mini size versions of The Ugly Christmas Sweaters quilts. These are my first finishes for the new year! The fresh snow provided a lovely backdrop and certainly made those colours pop. 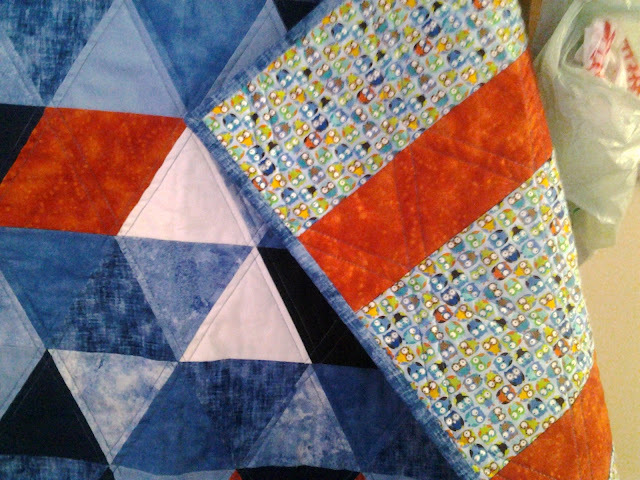 But, once again, I climbed aboard the trusty old hay wagon to get a full front shot of this little quilt. And the gentle (but very frigid) breeze enabled me to get that contrasting backing shot. Let me tell you... Once I got back into the warmth of the house, following this photo shoot, it was time for a nice hot cup of coffee. And a piece of apple pie. The Sweater Weather backing was the perfect choice - both in name and because of the bold turquoise background of that print. I love how it contrasts with the overall feel of the front of the quilt. And who can resist those adorable foxes? 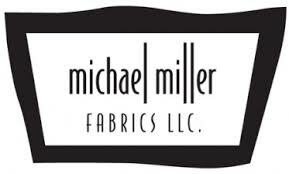 Thank you Michael Miller Fabrics!!! These Ugly Christmas Sweaters quilt projects have been generously sponsored by Michael Miller Fabrics. The quilt tops are made entirely of selections from the Cotton Couture collection. And the background and backing are from the Festive Forest collection by Tamara Kate Design. I loved working with these scrumptious shades of Cotton Couture: Watermelon, Soft White, Orange, Canary, Turquoise, Luna, Asparagus and Princess pink. These combinations looked great in those Ugly Christmas Sweaters blocks and blended well with the Festive Nest that I used for the background. I chose to quilt both of these finishes using the extended zig-zag stitch to mimic the look of actual knitted sweaters. Manufacturer's Recommendation: Cold Water Wash and Lay Flat to Dry! Hahaha! For my Super Mini quilt, I sewed some cute little corner tabs into the binding, for easy hanging. Just add a stick with a hole in it and we're good to go! Ugly Christmas Sweaters is a free quilt along that is being hosted here on the Sew Fresh Quilts blog. This design features a 6" block on each sweater and the sweater blocks finish at 12" square. These blocks are made using traditional piecing methods. No templates. No paper piecing. Only simple straight line sewing and diagonal seams. Easy to follow instructions are provided for every step of the way! The Ugly Christmas Sweaters quilt along includes material requirements lists for four different quilt size options and instructions for 21 different 6" block designs. But you can choose any 6" block to be featured in your very own version of the Ugly Christmas Sweaters quilt. "Ugly Christmas Sweaters" in MAXI Size finished at approximately 53" x 66"
"Ugly Christmas Sweaters" in SUPER MINI Size finished at approximately 14" x 14"
The Maxi quilt only requires 20 blocks and because I made 21 different 6" blocks for the quilt along, I used the 21st block and made that Wonky Star into a mini quilt. This was perfect timing! The Michael Miller Fabrics blog is called "making it fun". And they recently announced a mini quilt challenge. You can read about that here. The first post for Ugly Christmas Sweaters QAL went live on Monday. It would be so much fun to have you quilt along!